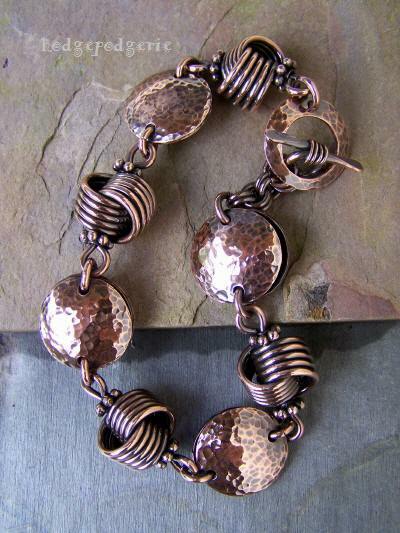 This beautiful solid copper bracelet will absolutely capture your heart! 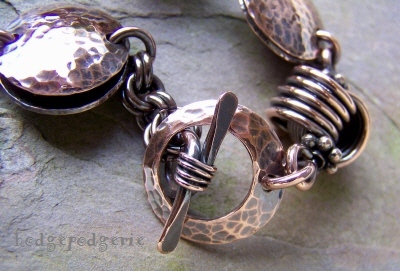 Combining gorgeous love me knots and hand-forged hammer discs, it has a nice heft to it. The discs are 3/4 inches in diameter and I've joined two of them per section, so no matter how the bracelet lies it looks the same. The love me knots are created in heavy gauge wire....talk about solid! 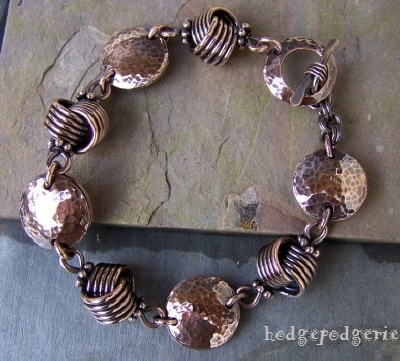 Finally, I've given the entire bracelet a lovely rich patina, enhancing the incredible textures of this warm, wonderful metal. I finished it with my own handmade hammered toggle-style clasp. The bracelet's smooth design is a delight to wear and may be easily paired up with your other favorite bracelets, but it has the presence to stand on its own! Besides its natural beauty, pure copper is said to have therapeutic properties and many arthritis and joint pain sufferers swear that wearing copper, such as in a bracelet, helps to provide relief from rheumatism, arthritis and stress. Return from "Love Me Knot! Copper Bracelet" page to "Bracelet Gallery" page.